TopPlace™ has gone native! 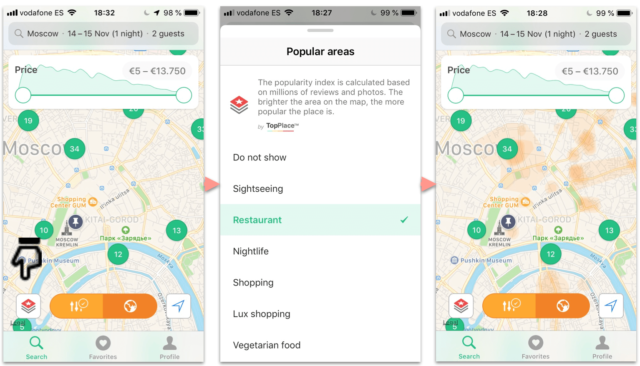 For the first time, TopPlace™ heat maps and Location Scores are available in a native app thanks to the Hotellook app. The launch required catering to the smaller screen size, incorporating the Hotellook branding as well as using the minimal memory and bandwidth of a phone. All things the team here at AVUXI are prepared for, allowing for a smooth and easy integration. We are also including 2 new custom interest categories onto the heat map. Hotellook was looking for a solution that would add value to their app. Specifically, they wanted to provide advanced location information around the hotels they offered. So they called us at AVUXI. TopPlace™ is easily customisable to any platform. During the process of working with Hotellook, we used our setup wizard to showcase how the TopPlace™ functionality can look on a mobile. Not many people know our tools are both responsive and mobile friendly. A phone’s reduced screen size focuses TopPlace™ to only show the most important and relevant information for a traveller. This facilitated a richer discussion regarding what Hotellook wanted. One of the most important aspects of our first native app experience that we are proud of is how easy it was to incorporate the TopPlace™ features into Hotellook’s branding. Maintaining the Hotellook brand as well as the app look and feel was easier than they thought. Hotellook asked us to extend the heat map selection criteria to include Luxury shopping and Vegetarian food. Did you know that we can add additional location criteria? Typically we recommend 4 main criteria: Sightseeing, Eating, Shopping and Nightlife. This is because we have spent a lot of time and effort researching what is the most important criteria for travellers. However when we sat down with Hotellook, we discovered they wanted to provide an additional, specific experience. Therefore they asked to add 2 new criteria: Luxury Shopping and Vegetarian food! Our database is structured to easily facilitate new criteria, so it was an easy addition. We look forward to doing more custom criteria in the future for companies who look to provide a specific type of experience. One of the other major challenges working with maps in native apps is data size. Any feature has to use both minimal storage space and transfer bandwidth. Map tiles are widely used in the industry but use a large amount of space. An alternative is vectors, which use significantly less space. TopPlace™ is available as both a map tile or as a vector solution. It’s part of the amazing flexibility we offer our clients. We hope to be launching TopPlace™ in more native apps in the future, so stay tuned!